Chicago pledges to help about one-third of its 560,000 immigrants become U.S. citizens through the Chicago New Americans initiative, in partnership with the Illinois Coalition for Immigrant and Refugee Rights and the United States Citizenship and Immigration Services. 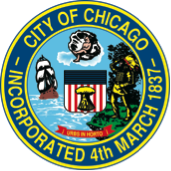 The city’s Office of New Americans and Illinois Coalition for Immigrant and Refugee Rights host informational workshops on naturalization at the City Colleges of Chicago. The Office of New Americans also implemented Citizenship Corners in Chicago’s public libraries, where information on the naturalization process is available in the most common languages spoken in Chicago, in addition to free citizenship workshops, English Second Language classes, and multi-lingual financial education classes. Other objectives of the Office under this initiative include launching a targeted campaign to naturalize City employees and integrating informational materials on naturalization into the Welcoming Portal and Welcome Station – an online portal designed to connect immigrants with resources available to them and immigrant resource center – respectively. Furthermore, the city’s Small Business Center provides services to immigrant business-owners and targets large immigrant employers for citizenship and financial coaching support. Staff from community organizations regularly visit schools with large concentrations of immigrant students and parents to create a one-stop shop offering information about the naturalization process, free immigration legal assistance, and financial coaching.